With the Woodstock 50th anniversary festival coming up this August, a lot of people find themselves reflecting on the 1969 event. For one man, reflecting on his Woodstock ’69 experience brought him a lot more than just happy memories. I had the opportunity to talk with Steve Gold, who not only attended Woodstock at the age of 15-years-old, but also has something rather remarkable to share. Festival Squad: So first of all, I just wanted to say thank you so much for taking the time to talk with me. And congratulations on Peace of Woodstock. This is such an insanely cool thing you guys have going on! Steve Gold: Thank you! Well, we’re excited about it. The response from comments we’ve gotten on Facebook, Twitter, and Instagram is just people who are excited about it. FS: That’s so great! I’m glad you guys are getting nothing but positivity for this. So before we go any further, I did want to explain a little bit about this for our readers who are unaware. You actually found the original 1969 Woodstock stage. That same stage that legends like Jimi Hendrix, Crosby, Stills & Nash, and The Grateful Dead all played on. Can you tell us a little bit about how in the world that stage ended up in your hands? SG: Well, I grew up in Sullivan County, where Woodstock was held. We lived about 15 miles from Yasgur’s farm. I was dating– well, I was only fifteen years old, so I’m not sure if I was “dating” someone– but I was dating this girl who’s parents owned a bungalow colony, cottages you rent for the summer. You come up with your family, and you stay there. So, I’m at my girlfriend’s parents’ bungalow colony one day, and it’s about four weeks after Woodstock. My girlfriend’s father asked me if I could help him unload his truck cause he was building a paddleball court. And I said, “Okay!” You know, I was dating his daughter, I may as well be nice. So, as we’re unloading the truck, he tells me nonchalantly that this was the wood from the stage at Woodstock. He goes, “I just bought it.” So, yeah it stuck in my mind, but so little time after Woodstock it wasn’t the historical or iconic event that it became. So it just, stuck in my head. I was 99% sure this was the stage, so I pay them for it. So we take the paddleball court and take down some of the plywood. We saw the markings that you see on the stage in the movie and in pictures, the logo, the different colored paint that they painted towards the back of the stage for the wiring so that they knew where the wires would go. All that. So after I saw all that, I knew this was it…now I was 100% sure. We took it down, and I sent it to an authenticator I found. They authenticate the date and type of wood. I never knew there was such a thing, but you google anything now and you find them. But, he authenticated it based on the markings, the age of the wood, and everything else, like the way the wood was made–it was made with a type of wood that was only made in the late 60’s–and all this other stuff. So, he signed off on it. Then, I decided to call my old girlfriend, whom I haven’t spoken to in 45 years, to see if she would maybe write me a letter. You know, a letter saying that yes, her father built the paddleball court with the stage. So, I call her up and say, “Robin, this is Steve.” I got her number through Facebook. And I tell her, “I want to ask you a question about the paddleball court.” Her first words were, “You know that paddleball court was built from the wood from Woodstock?” So I said, “That’s why I’m calling you.” So, she wrote me a notarized letter, saying that’s exactly what her father said. The cool part about the phone call was that it was on my 65th birthday. I said to her, “Robin, would you have thought, 48 years ago, I would be talking to you when I’m 65 years old?” I also told her that she was my first love, and I could never forget my first love. FS: That’s unbelievable. You must’ve been a pretty good boyfriend to her if she’s answering your calls 48 years later! SG: She was probably thinking, “I got rid of him once before. What the hell does he want?” No. I’m only joking. So, anyways, that’s how I found and re-found the Woodstock stage. FS: This has got to be like the coolest story ever. That’s amazing. So, now you and your partners, Dave Marks and Randy Garcia, are doing something pretty awesome with that stage. Want to tell us what you guys have been working on? SG: Well, when we first bought this, we didn’t know what to do. Do we just go to an auction house and sell the whole thing at an auction? We went back and forth. 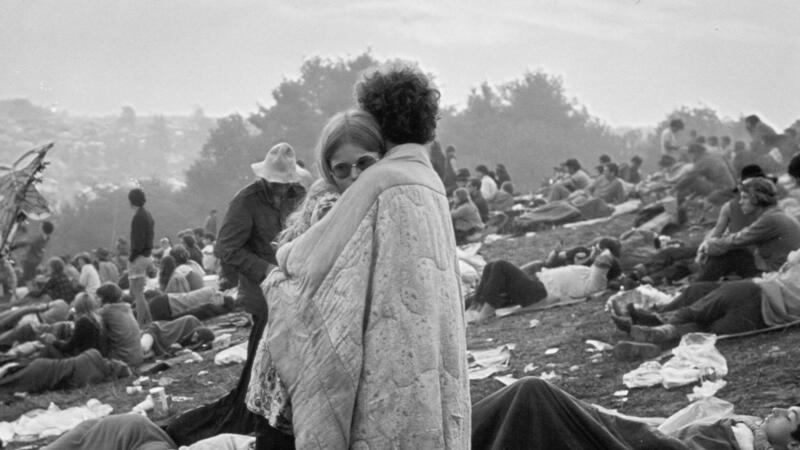 The whole concept of the stage at Woodstock was that it was the focal point of the concert. If you look at the movie or all the pictures, everything besides what went on within the crowd, I would say about 80% of it all took place on the stage. FS: Sitting in your hands! SG: You know, people have gotten married on the site where the stage was because they feel it’s so magical. Even my two partners, Dave and Randy, are huge Dead Heads. They were just amazed that they could touch the stage that Jerry Garcia played on. So we decided to cut it [the stage] up, and sell it in pieces. We put them in stage frames or stage cubes, and we made the peace pendant, so that a lot of other people could enjoy the magic that we felt. That’s why we’re doing this. But the other thing that we’re doing is, in a couple weeks, we are going to announce the charitable contributions that we’re making. We created a product called Stardust, which is the saw dust from the stage pieces we’re cutting. We’re putting the dust into a mini glass bottle that’s corked, and we’re going to be selling them for $19.69. Most of the proceeds will go to to five different charities that we feel show what Woodstock was about in peace, love, and understanding. One of the charities we’re doing it with is The Vietnam War Memorial. We’re doing that in honor of the 58,000 people that were killed in Vietnam during the war. We’re doing something called Ribbons for Jaime. When she was killed in the Parkland shooting, her father started a fund. So, in honor of probably close to now 700 students that have been killed in American schools since Woodstock, this fund is going to help get more sensible gun laws. Also, we are doing the Jed Foundation. Their focus, among other things, is on teen suicide and bullying. Then we’re doing Feed the Children, and another called WhyHunger which is dealing with food of course, but also they help the homeless. They’re also there for when there’s droughts, hurricanes, or dam breaks. So we brought all these charitable things to give that Woodstock spirit. FS: You are just absolutely amazing. SG: Can I record that so that I can give it to my wife? FS: Oh absolutely! After hearing all of that, you have me all teared up. She has to believe you’re amazing too. FS: I just want to, and I’m sure a lot of other people will want to after reading this, say thank you. You’re not only bringing awareness to all of those really important issues, but you’re doing something really special about all of them. Especially with the gun laws. SG: I mean, today. I don’t know if you’ve heard the news, but unfortunately, one of the teenage girls who survived the Parkland shooting committed suicide because she couldn’t take the guilt anymore that she survived and others didn’t. FS: Oh my god no. It’s just so unbelievably infuriating and defeating to hear about all of these shootings and to hear absolutely devastating news like that, and not a single thing is being done about it. Whatsoever. It’s like we’re supposed to just accept these casualties? SG: You’re right, nothing is being done! I mean, just look at New Zealand. Now, I don’t mean to get all political, but they had one mass shooting, and five days later, they have new gun laws. FS: Exactly! I just have no other words to say about that other than it is unbelievably frustrating and disappointing. Which is why it kinda makes me emotional when people like you are working so hard to do something about it. Because, the people in charge aren’t doing a damn thing. So, again, thank you. SG: Listen, you have to. Because if you don’t, there’s not going to be anything left. But thank you. So that’s the story of this whole thing. Is there anything else you want to know? FS: Yes! I have a couple more questions. Let’s do fun questions now, if that’s okay. FS: Let’s go back to 1969. So you went to the original Woodstock at the age of 15. SG: Correct! I went back and forth from the festival because I knew the backroads, so that was one of the advantages of being local. The other advantage was I watched it being built. It wasn’t that far from my house so we went there everyday to see what else was being done. That was pretty cool seeing all of the trucks and all of the people and all of the hippies putting this thing together. I was lucky to be a local, along with my brother and my cousins, that we had the luxury of coming back and forth. When you went there, you didn’t know what to expect! My cousins brought their hair dryers, because they were going to be there for a few days. So they thought they were going to be able plug it in somewhere! It was incredible. It really was magic. Over a week’s time, when people started coming, it was just magic. There was just–and now I didn’t want to, but I guess I’ll use a 60’s term–there was an unbelievable vibe in the air. The best part was how the whole resort community, the hotels and the bungalow colonies, came to the rescue. There was no food. They ran out of food at Woodstock, so all the hotels and bungalows came together to make food for all the attendees. There were truckloads and busloads of food constantly being transported in. It was just really cool, the giveback that I saw at such a young age. How our community, not just what was going on at Woodstock, was working together. How the whole county came to work together. No one cared that they were hippies or they were white or they were black. They just knew that there was kids without food, and they were going to feed them. FS: And you know, that’s how it’s supposed to be! I know you said that, at the time, nobody knew what Woodstock would mean today, but I just cannot imagine what it must’ve been like to be there. 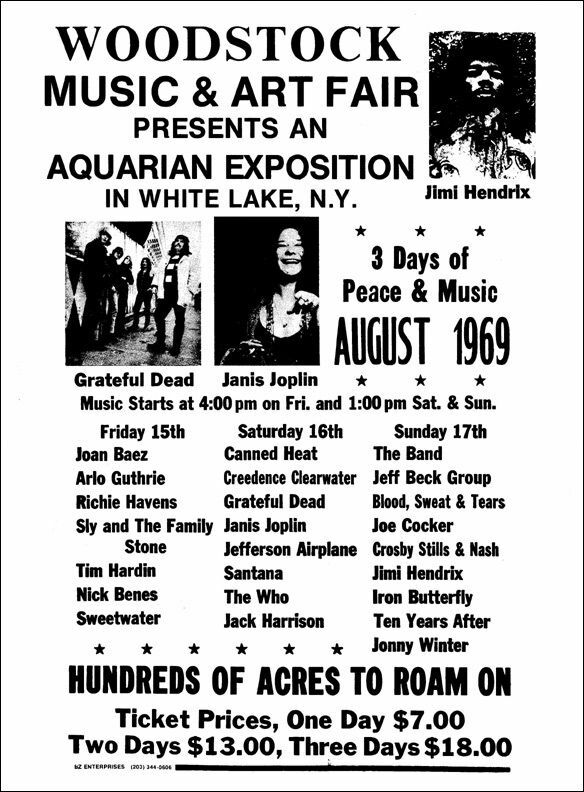 I actually went to my first festival at the age of fifteen too, but I can’t even begin to think of what it must’ve been like getting to experience Woodstock at that age. Incredible. SG: You know what made it so amazing was that you didn’t know you were going to experience such an amazing event. You have Coachella and all these other big festivals now, and you know what to expect when you go. But, nobody knew what to expect with Woodstock. A lot of the bands that played, they weren’t that well-known yet. Just no one knew! I think it was a time where, because of the Vietnam War and Civil Rights and all of the protests against Nixon, I believe that this was at that tipping point where this was going to be the convergence of the summer of 1969 that everybody was just coming here. Word of mouth got around from the underground newspapers, and that’s how so many people found out about it and ended up coming. FS: I just have to ask, who was your favorite performance from that weekend. SG: Well, I caught the end of Jimi Hendrix doing The Star Spangled Banner which was incredible. I thought The Who was great! Janis Joplin was great. Joe Cocker, probably one of my favorites. Santana. There wasn’t anybody that I didn’t like, maybe Tim Hardin wasn’t my type, but it was just all amazing. Three o’clock in the morning, bands are still playing. FS: Now, although I guarantee nothing can compare to what you experienced in 1969, do you plan on attending this year’s Woodstock 50? SG: My son definitely wants to go the Watkins Glen for the Saturday shows. So, more than likely I’ll be there. The only sad thing, for me is the acts playing there are great, but the sad thing is that no one is going to really watch the show. They’re all going to be on their cell phones. It’s going to ruin the experience of what Woodstock really was. FS: I totally understand that. And I can understand why maybe some people who were at the original Woodstock might feel odd about it coming back, because it just can never be the same event that it was. SG: You can’t re-create spontaneity. It’s great to have the 50th anniversary and all, but you’re never going to re-create what was there. Woodstock is a great brand name. I think what Michael wants to do in bringing social causes to the forefront is great. I hope it works, but I’m upset that they’re not going to really capture the true magic of what it was. I hope that Michael’s vision works and is not interfered with by something out of his control. The whole world will be watching. It will be a phenomenal platform regardless. FS: You know, any time I’m ever asked “If you could go back in time, where would you go?” My answer is always, “Woodstock,” so I have to say that I am pretty excited to even have the chance to go to it, but I totally understand that it is not going to be the same whatsoever. Unless there was a way to lock everyone’s cell phones away, it just can’t happen. But I hope the world surprises us, and people will get into the true Woodstock spirit for the weekend. But who knows. Mr. Steve Gold it has been a pleasure getting to talk with you, and I definitely hope we have the chance to catch up in person during all of the Woodstock festivities this August. SG: Thank you for reaching out! I’m sure we will stay in touch somehow. You know what, bring the cell phone to Woodstock so I can text you where I am! If you’re interested in buying a piece of the Woodstock stage or one of the Stardust bottles, visit the official Peace of Woodstock website here!